I hope y'all are having a fab week so far! We are busy getting ready for a trip we are taking to Charleston, SC. I am SO excited and can't wait to share our trip with y'all along on Instagram & Instastories, so be sure to follow along HERE. So, who else is excited that camo is a big trend for fall!? I mean, has it ever NOT been a trend here in the south? Of course, camo in the fashion world does NOT have to say "let's go hunting" and that is one of the reasons I love it so much, because, well....I don't know how else to say it except I'm not much of an "outdoorsy" kind of girl-haha! So, one of my best tips is whenever you are incorporating a trend into your wardrobe, make it YOUR own. Maybe you're not that crazy about camo....but suddenly when you add "girly" accessories, it becomes your own. Or, maybe if you add some "edgy" rocker vibe accessories, and suddenly camo becomes your own. Or, maybe you want to play up the casual nature of camo: pair it with some track pants and an athleisure-type #ootd, and it becomes your own. That is one of the BEST things about fashion: it can be an avenue for your creative expression as you take a trend and truly OWN it, girlfriend! One of the key pieces of advice I can also give about wearing camo is to take 1 camo item and wear that at a time. 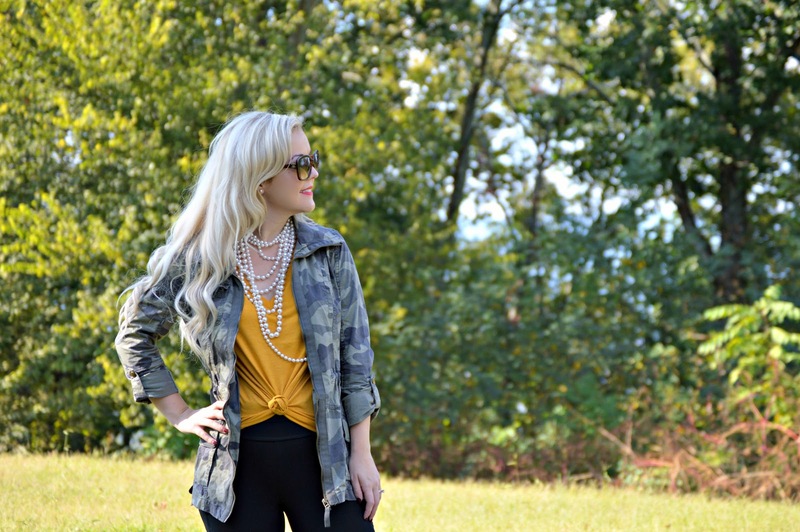 This fall, I have seen camo in literally EVERY article of clothing...which I love!! But, one way to not look like you're about to spend your day up in a tree stand is to take one article of camo and focus on it at a time. That's what I LOVE about this utility jacket. You can mix & match it in so many different ways to make this trend your own. For my look above, I decided to give my camo a "girly" vibe (which, if you haven't guessed by now, I am such a girly girl) with feminine accessories. I mean, let's be honest, what is more feminine than pearls?! THESE Steve Madden pearl slides are some of my new favorites for fall. I also paired it with a chunky pearl necklace to dress up my camo (and plain t-shirt) even more! 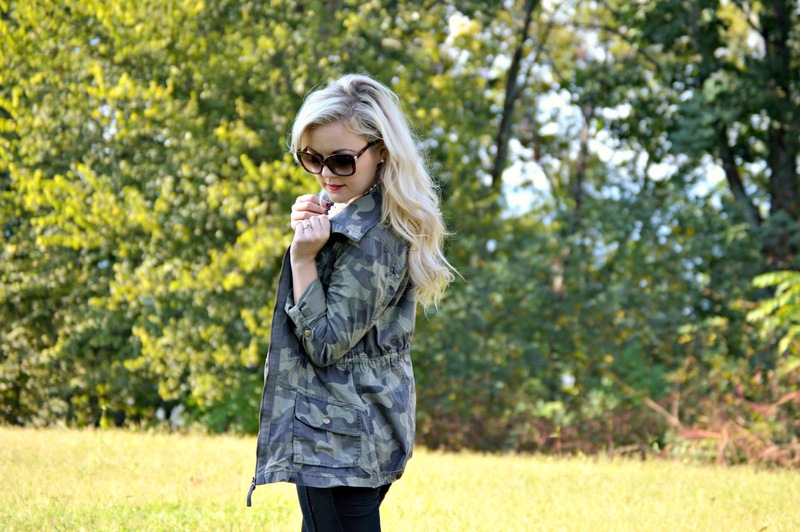 Besides this cute camo utility jacket, I have also seen THE cutest camo sweatshirts, pants, and t-shirts this fall! Be sure to shop some of my favorite camo pieces in the widget below!!! How are YOU going to wear camo this fall!? Leave me a comment and let me know! How to Use LIKEtoKNOW.it to Shop My Looks!